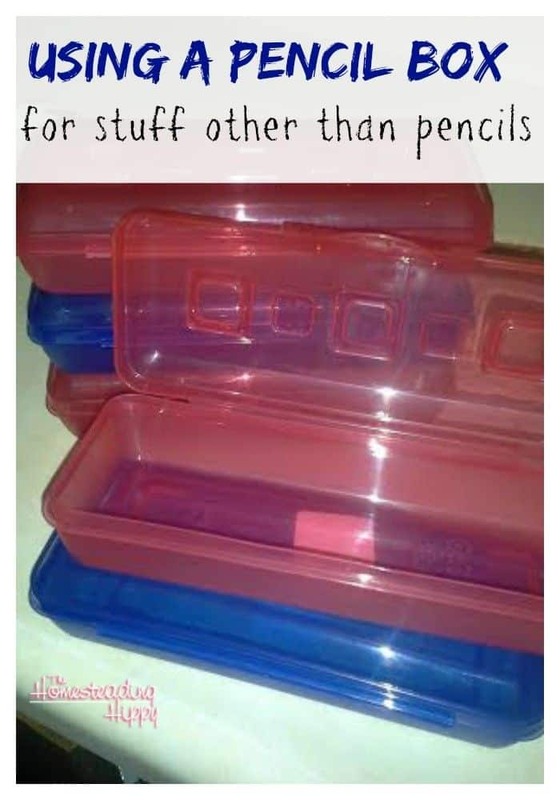 Back to school supplies are all over the place and the beloved plastic pencil box is ever prominent. I found these “1/2 size” boxes at the local big box store and was totally floored at what I could do with them. 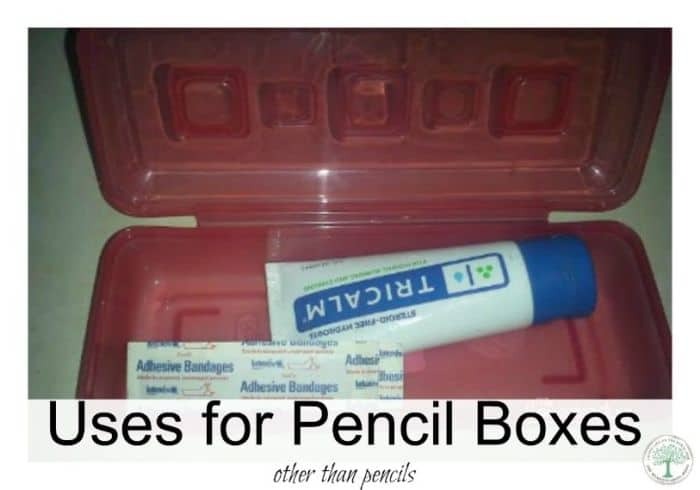 Think they are just for holding pens and pencils? Not even! Here’s a few more ideas to use these little gems! And, the small boxes are only $.49, so you might want to grab a couple. 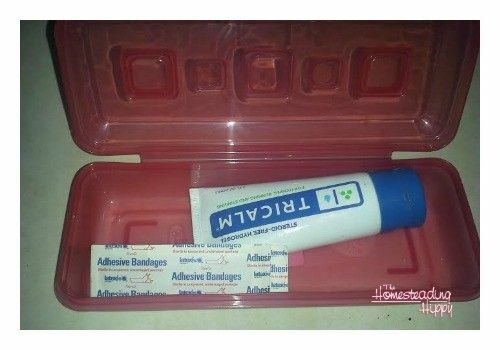 For under $5, you could make up several quick first aid kits to have in the car, in your purse, to go bag, and even in a gym bag. These little boxes hold an entire box of bandaids, some antibacterial cream and a couple of hand wipes. Add in a a couple of dollars for an emergency and you’ve got it made! Traveling or camping? 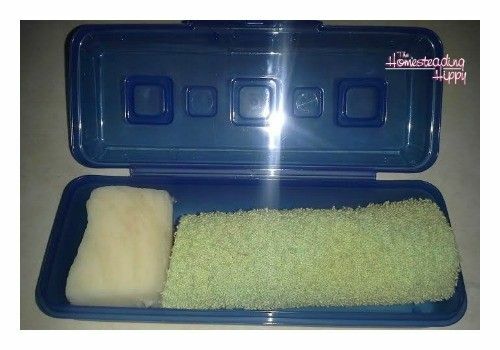 These little boxes make the perfect holder for toothbrushes and toothpaste, soap and washcloths, or even small bottles of shampoo/conditioner/deodorant. While not completely water and sand proof, these little gems can hold money, a cell phone, or other small items and help keep them more secure. Try putting video games in these little boxes instead of spending money on a “holder”. They are easy to open and snap shut, keeping the games secure and yet close by. You could even add some packs of dried fruit or nuts for a quick access snack. I have to admit to loving these for holding the small stuff that normally gets lost at the bottom of the abyss that is my purse. I have one that holds all my pens (genius! ), my lipgloss, a small hairbrush, and my cell charger cord. Why not a makeup bag? They are far more flimsy and for some reason, I can’t get what I need to fit in there. These little boxes are perfect for just about anything! Great ideas! I love being able to use items for more than they are intended! Thanks for sharing at the #summerfamilyfun link-up! I hope you’ll join us again next week!